When you think of a luxury trip, the Bahamas come to mind. But there are things you should know about going to the Bahamas. Here are 8 facts. Are you thinking of taking a luxury vacation in the Bahamas? Tourism is the Bahamas is booming! Over six million people visit the islands each year. You can travel directly from most major cities in North America. It doesn’t matter whether you’re in Texas or New York City, the Bahamas is always within reach. When you’re traveling abroad, it’s always recommended to know about your destination before you arrive. Here are the things to know about going to the Bahamas before you go. Let’s take a look! For many international travel destinations, you need six months valid on your passport before it expires. It can take a while to apply and process a new passport. That’s why you need to check your passport is up-to-date before you book your vacation. You can pay with Mastercard, American Express, Visa and any other credit or debit cards. Traveler’s cheques are also usually accepted. You may find that your credit card company charges you a fee for making transactions or withdrawing cash. It’s recommended to check with your credit card company about this before you depart. It’s also good to make sure you have cash with you. Some places don’t accept cash. If you do want to withdraw cash or visit a bank, be aware of the opening times of banks in The Bahamas. Banks are open Monday to Thursday 9:30-3:00 and on Friday 9:30-5:00. You don’t need to worry about currency exchange rates either. The Bahamas Dollar is pegged to the U.S. dollar. Therefore, you can use U.S. dollars when you’re in The Bahamas. Since the U.S. dollar is equal to the Bahamian dollar it means that you don’t benefit from the exchange rate. This is a disadvantage compared with other destinations, such as Southeast Asia, which significantly benefits American tourists. Therefore, in the Bahamas, everything costs roughly the same as in the United States. In fact, some studies have claimed that The Bahamas is the seventh most expensive place in the world to live. That doesn’t mean that you shouldn’t travel to the beautiful islands. It’s just important not to assume that you’re going to have a cheap vacation. Did you know the Bahamas were once under the governance of the British Crown? The Bahamas remains a mix of many cultures. There are many leftovers from the British rule. One of the most obvious examples of this is driving on the left-hand side of the road. If you’re not an experienced driver on the left-hand side of the road, then you may prefer to take public transport and taxis. It’s also good to know that you can always negotiate your fare for taxis in The Bahamas. However, if you can’t help but get in the driver’s seat, be alert. Not only do you need to keep to the left-hand side. But also, you may find that drivers are especially aggressive on the roads in The Bahamas. Do you want to be able to speak the language of your vacation destination? You don’t need to bring your language learning audioguide with you on your trip. Don’t worry while you’re in The Bahamas. The official language of the Bahamas is actually English. Even though many of the peoples of the Bahamas speak a Bahamian dialect, it’s easy to communicate with each other. When something is impossible we say “when pigs fly”. However, this is The Bahamas is paradise. That doesn’t mean they have flying pigs. But they do have swimming ones. The Big Major Cay, which is also known as the Pig Beach, is famous for the porky friends. You’ll find pigs enjoying the shallow areas of the water. However, don’t feed the pigs! Tourists have recently been blamed for the death of a number of the pigs. There are also claims that alcohol was given to the pigs by tourists. When is the best time to visit The Bahamas? This is a common question to ask. The climate in The Bahamas is tropical throughout the year. That’s why it’s important not to forget your sunscreen when you travel here. It’s important to know that between June and November it is hurricane season. Therefore, this is probably not the best time to visit the islands. That’s why many people prefer to visit The Bahamas between Nobem. If you want to take your vacation during the hurricane season, make sure you keep track of the weather reports during this period. Also, make sure you check with your airline for delays before your departure. Officially the tap water is safe to drink in The Bahamas. But visitors to the island should stick to drinking bottled water. Therefore, you should also avoid vegetables and fruits which cannot be either peeled or cooked. It’s not always easy to resist the offer of trying some fresh fruit at one of the food markets in The Bahamas. Just say “No, Thanks” and keep walking! Now you know what you need to know before going to The Bahamas. It’s always better to do your research before you visit a place. 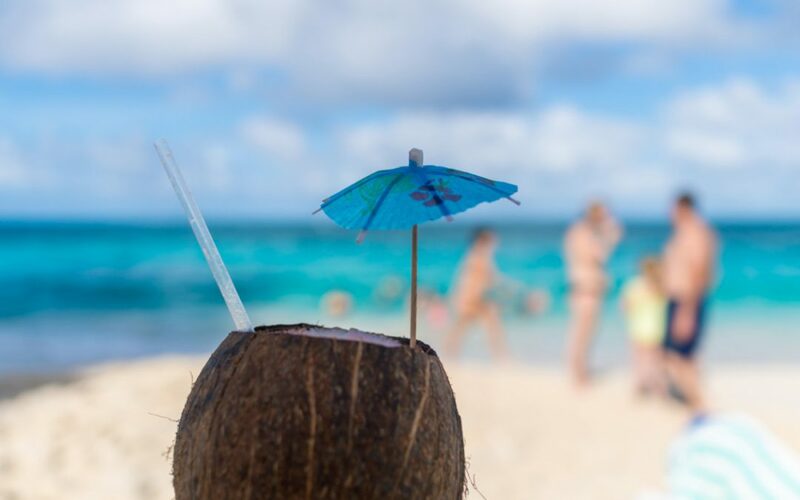 If you want to discover more about how to make the most of your vacation in The Bahamas, check out our blog on the 7 best things to do while you’re there.